I can't believe January 10th already, seems like ages ago now since the hub bub of Christmas and New Years and all over for another year. Where does the time fly???? I have been busy with some personal family stuff and that has been keeping me busy but I have had a bit of time to play with some of my arty creations. Between Christmas and New Years I did get myself a die cut for some flowers to make roses and I made a lot of roses during that week. Funny how they seem to disappear really quick and before I know it it will be time to make more. Valentines is coming and what a pretty thing to add to some creative goodness. I will show a pic of them another day. Sorry I didn't take one this evening. Well this will be quick as the bedtime is drawing near and Lesley needs sleep. I get real ugly when I don't sleep and seems lately it has been taking me a while to get to sleep. So here are some things I have been working on. I started a new FlickR group for monthly matchbox swapping and so far so good we have 13 eager members. I don't really mind if the group stays small but it is always nice to have a few more in case some don't want to swap for that month. Here I made this little 32 count matchox, I covered it with some paper I first stamped with Versamark Watermark ink using a background crackle stamp, then I embossed using a gold glittery Embossing powder. Let that dry then I painted the paper with 3 Twinkling H20 colours, a lime green ,rose blush and a sort of night blue. I love Twinklers as they always give the paper a nice shimmer when dry and the gold EP resisted the paint and left the gold shimmering with the paper. So lush as some of my arty friends say. 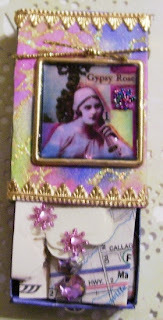 Then I used gold German scrap to line the top and bottom. I used an Artchix inchie photo frame, inchie image and then placed Glossy Accents onto the photo and added some nice micro beads to that. I then put the photo charm on a gold string and tied it securely. The box is filled with some arty goodness for my partner. I wonder who it will be? Next is an ATC I made for a FlickR monthly ATC group I joined. The theme this month is postal or anything postal related. 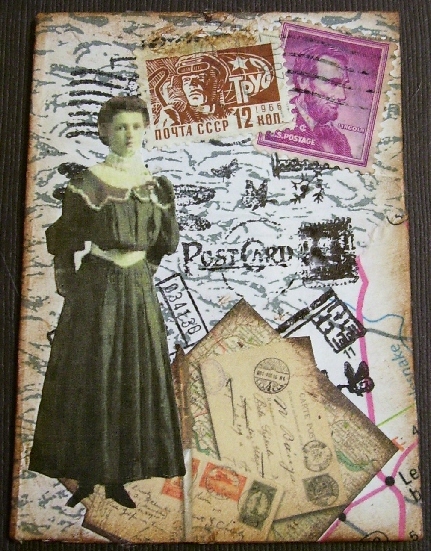 I used the inside of a security envy, stamped with a small acrylic postal collage stamp (thank you Becky) in Black Soot DI. Added some stamps that I collected from other swap partners a piece of a map and some little envies from my stash (thanks Kathy K knew those would come in handy some day)and the woman image is from FlickR . Hope my partner likes it. And finally here is an altered Domino. I have been swapping dominoes with another FlickR member for quite a while now and each month one of us picks a theme then we make each other one and send it. I guess my last domino got ripped out of the envy and Lori never got it with her Christmas card but I will redo it, it really didn't turn out as I expected. So this domino is a fairy in a bottle. The domino was inked with my new Alcohol inks, love how they pool and blend their colours together. Love the contrast of colours as well, green is my fav colour so this really is one of my fav's so far. The domino was then embossed with my gold sparkly EP. 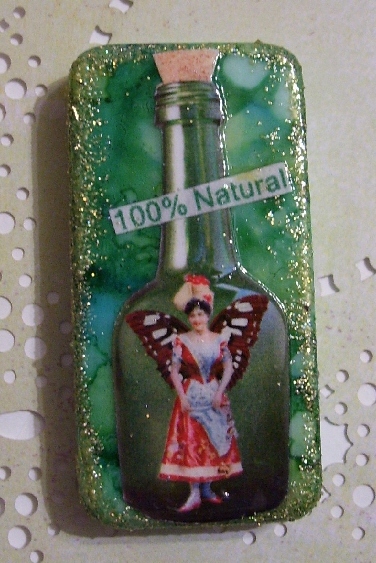 Then my image is from Artchix Fairies in a bottle, cut and trimmed and then I put a layer of Glossy Accents on top so everything is trapped in. Well folks that is it. I rambled long enough, now time to go to bed. Thanks for dropping by and stay tuned for my arty goodness. Valentines is coming and I feel more tags are in store. Oh, these are wonderful! I really love that last piece! So gorgeous! Oh Wow, these are all beautiful projects! Great projects- the green is really pretty. I never thought of dressing up a matchbox top like that- wonderful! 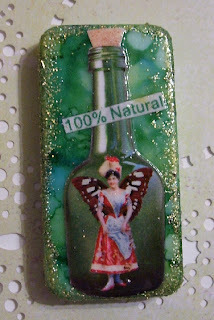 Fabulous creations here Lesley, I particularly love the altered domino with the glass bottle - fab! Thanks for you lovely comments on my matchbox! Lovely creations, the domino is awesome!! !